This June, guests visiting the more than 2,000 animals and enjoying the beautiful landscapes spread over 216 acres at Brookfield Zoo can add even more excitement and diversity to their trip during the zoo’s ¡Viva la Fiesta! on Saturdays and Sundays, June 7-8 and 14-15, from 11:00 a.m. to 4:00 p.m. 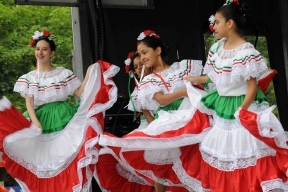 This fun-filled four-day event invites guests of all ages and backgrounds to join in the festivities at the zoo’s East Mall to sample authentic Hispanic food and refreshments and to enjoy local bands and dancers representing South and Central America, and the Caribbean as well as artists and artisans. Roaming animals native to those regions will add an up-close-and-personal highlight to the festivities. ¡Viva la Fiesta! is free with general admission. Food, drinks, and arts and crafts vendors will be available all through the East Mall at the festival. General zoo admission is $16.95 for adults and $11.95 for children ages 3-11 and seniors age 65 and over. Children 2 and under are free. For best admission values, check out the zoo’s membership packages, and special offers such as the Zooper Fun Pass or Build-Ur-Ticket. ¡Viva la Fiesta! is sponsored by Dulcelandia and Mexico Tourism. For further information about the festival, visit www.CZS.org/Viva or call (708) 688-8000.